On 27 March 2014 The Guardian published a story that the top 412 BBC managers were paid an astonishing £50.8 Million pounds last year. The litany of expense claims also outlined in the article truly beggars belief. Yet another outrageous and unedifying example of BBC largesse is on display for all to see. To add insult to serious injury, the BBC recently commissioned a ‘comedy’ series titled “W1A”, which is an apparent reference to the postcode of the new £1 BILLION pound BBC Broadcasting House in Central London. This absurdly ridiculous series attempted to make light of the BBC’s own truly horrendous waste and mismanagement. The joke, if there is one, is firmly on the licence fee payer who is threatened with criminal prosecution for not paying for the whole sorry affair. The cause of the excess is easy to understand. The BBC is the recipient of £3.6 Billion a year in TV Licence tax revenue which it does not have to work for. Freed from the commercial constraints governing other broadcasters, the BBC wastes money simply because it can. What is to be done? A year is a long time to wait for a government review and for a likely stitch up of the UK public who again will be lumped with another decade of BBC excess and revenue raising abuses. What the BBC will never tell you is there is a perfectly legal alternative to stop paying the BBC its extortion money: Go Catch-up TV only. The link to the TV Licensing online “No Licence Needed” declaration is here. A TV Licence is only needed if your household watches or records live broadcast TV. All internet based catch-up and on-demand services that are not simultaneously being broadcast do not need a TV licence. There has never been a more important time to go Catch-up TV Only in the UK than now. It is a completely moral decision not to continue funding the BBC. It is also the best way to register a protest and the fastest and surest way to hasten the demise of this wasteful, corrupt and biased organisation. Like every other tax, once the BBC have got their grubby mitts on all that lovely moolah, £3.8 billion of easy tv access tax revenue it means it has to be got rid of. Doesn’t matter how the BBC get rid of all that money it has to be got rid of or it doesn’t justify demanding the enforced tBBC tv licence funding scam to continue. Which is why the bulk of £3.8 billion gets wasted on all sorts of vanity projects, failed IT projects, bloated salaries and pensions. It is why the BBC tv licence must be scrapped and replaced with voluntary subscriptions. 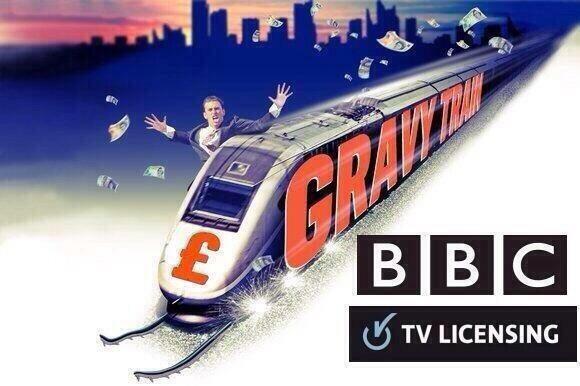 The BBC gravy train just keeps on rolling, but someone should tell them they are running out of rail tracks, soon it will be the end of the line?